It’s Fall. It’s football season. It’s my birthday month. It’s the last month I have to work on my Master’s Thesis. I love October! Unfortunately, we often still get ridiculously warm weather in Oklahoma during the month (or we could get ice and sleet, ya never know) and so my “Soup Mondays” might get interesting! I love my Salad Mondays when the weather starts to get sunny and the days are long, but I am always so happy to transition back into my Fall/Winter menus. There’s just something so comforting about having a hot, hearty bowl of soup waiting for me at the end of the day. Here’s my planned menu for October 2017. I hope you will take it and alter it to fit your family’s preferences and schedules. You can find all the recipes (and a few extra ideas) on the October 2017 Menu Pinterest Board. Happy October! Happy Birthday! Happy Halloween! Come fall every year, I am loving my boots. I wear them all the time- so long as it’s under 65 degrees. What I don’t like about them is that my shoes are stored in the hanging shoe organizer or my built in closet shelves, which are not tall enough for my boots. Needless to say, my boots always end up flopping over on the closet floor. I just saw this in Pinterest- cut a pool noodle to fit the shaft of the boot and place the pool noodle inside. It will help the boots stand up straight in the closet! ** Click on the picture to take you to the source. Dump one can of crushed pineapple into a cake pan- the pan does not need to be greased. Dump one can of cherry pie filling right on top of that. Use a spoon or spatula to spread out the fruit evenly over the bottom of the pan. Sprinkle a white or yellow cake mix as evenly as possible on top of the fruit. Pour one stick melted butter over the cake mix and then sprinkle chopped nuts on top. Bake at 350 for 45 minutes. The topping gets crispy and the inside stays gooey and delicious! It has been too long since I have written a blog post!! September has been extremely busy so far. This week’s QuickTip is to sleep better by stretching. Stretching for 5 minutes before bed can help relax the muscles and make it easier to find a comfortable sleeping position. You could follow this 8- minute yoga sequence or try your own. It works really well for kids who have trouble winding down too. It is September 1st, y’all! The school year is in full swing, the county fair is in full swing, and this is my last month of 2017 to do Salad Monday. Oh, and football. I am really looking forward to these meals, guys. My mouth started watering and my stomach started growling when I built the September 2017 Menu Pinterest board. 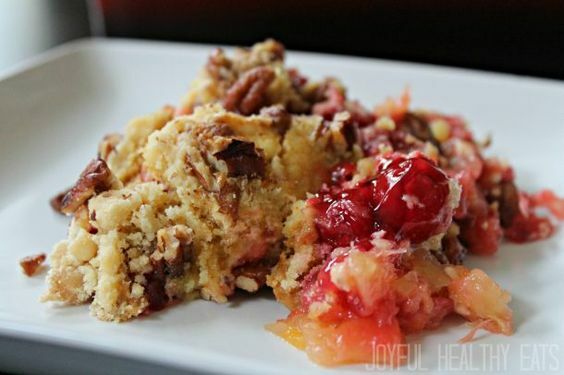 I am planning to serve up some of my all-time favorite desserts- cherry pineapple dump cake, anyone?- and I will be trying some new recipes as well, like sheet pan steak and veggies and slow cooker BBQ ribs. Ya hungry yet?